In a straightforward way, this Special Report explains the rights of part-time workers and shows how to best manage them. It answers all your questions and highlights the possible pitfalls. You’ll learn how to make the most effective use of part-time workers - all in a legally safe, harmonious way. Plus, the complementary documents will help you put all the advice into practice. Take a look at your options below. 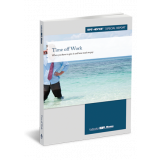 This Special Report helps you, as an employer, make sense of the complex rules surrounding time off work. It clearly explains which rights apply and how much you have to pay (if anything). So when time off requests arrive on your desk, you can take action with clarity and confidence. Staff can take time off work for a whole host of reasons. Many of these rights come with a statutory entitlement and minimum level of pay. But getting to grips with these ever developing rights can be tricky for any employer. Complemented by a series of ready-to-use documents, this Special Report ensures you're able to handle time off work requests in a safe and efficient way. This Special Report shows you how to deal with flexible working requests swiftly and efficiently. Recent legislation has extended the right to request flexible working to all employees after 26 weeks' service. So it's vital your policies and procedures are up to date and in line with these rules. In easy-to-follow steps, this Report provides full guidance on the procedures you need to follow. The flexible working regime is a potential minefield for employers. But there's no need to worry if you know the rules. All the advice and solutions in this Special Report will help you apply the law correctly. It's all you need to play it safe. This Special Report ensures you’re able to deal with pregnant workers in an efficient and safe way. It covers all you need to know, from recruitment to post-maternity leave. With this Special Report, you’ll have the law relating to maternity rights at your fingertips. It’s a must-read for all employers that want to approach this tricky subject correctly. How should I handle time off requests for antenatal care? What can I do in case of poor performance? How do I deal with sickness absence? Do I need to carry out a risk assessment for a pregnant worker? Is it possible to dismiss or make a pregnant employee redundant? Can I take disciplinary action against a pregnant employee?